Bacteria and fungi utilize nonliving organic matter as a carbon (C) source, fueling microbial production and remineralizing that C as CO2. In the case of POM, such as decomposing leaves, microbial activity may make the organic substrate more accessible to large consumers such as leaf-shredding insects by softening the tissues, and the fungi and bacteria are themselves an easily assimilated source of C. The uptake of DOM by microorganisms provides a pathway for an abundant C source to enter fluvial food webs. Studies of lake and marine systems (Pomeroy and Weibe 1988) and more recently of rivers and streams (Hall and Meyer 1998) document that C flux through microbial food webs is much greater than was previously recognized. Microbial production can be consumed directly by those organisms capable of ingesting individual cells and biofilms, or it can be ingested through its association with larger particles, including FPOM and coarse particulate organic matter (CPOM). 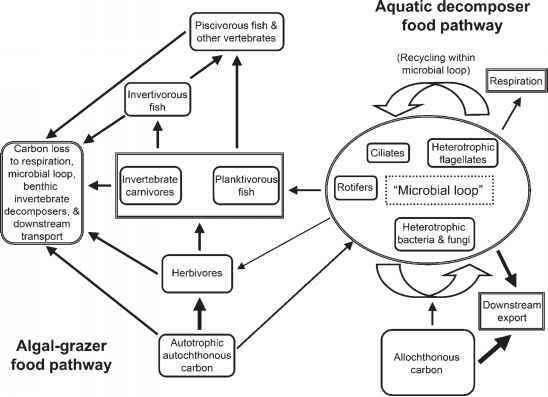 Ingestion of individual bacterial cells implies a food chain of small and then larger microconsumers before eventually reaching macroinvertebrates and fish, raising the possibil ity that the original microbial production is largely dissipated within a "microbial loop.'' Thus, a key question has been whether the mi-crobial food web is of interest primarily in its own right and for its role in recycling nutrients and remineralizing C, or whether it also is important as a pathway of energy flux to higher trophic levels. Current evidence supports both possibilities. The likely primary consumers of microbial production, especially of bacteria (it has long been recognized that fungi are consumed along with leaf fragments by macroinvertebrates), are the meiofauna. These are protozoans and metazoans <0.5 mm in length, and possibly as small as 10 |im. The early instars of macroinver-tebrates may be included as "temporary" meio-fauna if they fall within this size range. These are an often neglected component of the fauna and may contribute half or more of the diversity and abundance of stream ecosystems, particularly due to rotifers and larval midges of the Chirono-midae (Robertson et al. 2000). Most of the meiofaunal groups, including protozoans, gastro-trichs, rotifers, nematodes, microturbellarians, small oligochaetes, and microcrustaceans, are suspension feeders or browsers feeding on bacteria or on small particles coated with biofilm. Very few studies have examined this feeding link, although Perlmuter and Meyer (1991) documented significant consumption of bacteria by a harpacticoid copepod. Some studies have shown that flagellates and ciliates are able to exert significant grazing pressure on bacteria in stream-bed sediments (Bott and Kaplan 1990) and in the water column (Carlough and Meyer 1990). The effectiveness of direct meiofaunal consumption likely varies with the composition of the assemblage, and has been found to be greater when large ciliates and rotifers are present (Borchart and Bott 1995). Predator-prey linkages within the meiofauna also are little studied, although many taxa of predaceous habit are known from among the rotifers, cyclopid copepods, oligochaetes, microturbellarians, mites, and nematodes. The larger members of the meio-fauna may be consumed by predaceous invertebrates such as predatory tanypod midges (Schmid and Schmid-Araya 1997), larger predators such as Sialis and Plectrocnemia (Lancaster and Robertson 1995), and even by fish, as Run-dle and Hildrew (1992) document for the stone loach Noemacheilus barbatulus in English streams. Because members of the meiofauna are small and soft-bodied, assessing their presence in the guts of predators obviously is a challenge, and the resultant data are qualitative rather than quantitative (Schmid-Arraya and Schmid 2000). Bacterial production within the water column usually is modest (Figure 7.15), although it can be important in larger rivers, especially those with floodplains and back channels (Meyer 1990) or receiving organic enrichment (Admir-aal et al. 1994). Even under the most favorable assumptions for suspended bacteria, however, benthic bacteria dominate community respiration (Edwards et al. 1990). Some filter feeders are capable of direct capture of bacterial cells, including mollusks, cladocerans, and black fly larvae, but it is doubtful that water column bacterial production is important to the macro-consumers of river ecosystems, and instead the primary function of bacterial production is C mineralization.